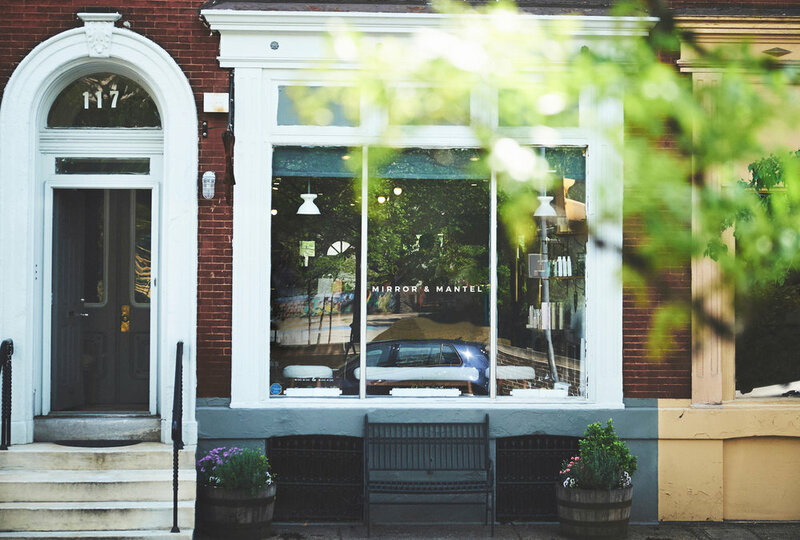 Mirror & Mantel is a warm, sun-filled, boutique Hair Salon located in Center City Philadelphia opened in 2012 by Hairstylist Katie Cooke and her husband, Sam Tropio. Their mission was to create a studio space that was comfortable and inviting to visitors, committed to natural and local product lines, and most importantly one that provided their clientele with creative stylists that are experts in their craft. All of the hairstylists at Mirror & Mantel are skilled as both stylists and colorists. The teams experience working as educators in the industry has helped create a collaborative, forward-thinking environment that is, most important to our goals, unpretentious. We are excited to work with our clients personally and without the use of assistants. You can be confident that you will get the very best result with every visit that you make! We hope that when you visit us at Mirror & Mantel you will feel as welcome as you would at a friends home. We truly believe that feeling at ease in our salon will allow you to say and get what you really want. We are dedicated to only carrying product lines, from coloring to styling, that are vegan and cruelty free with a focus on products made locally and in the USA. All of our products are environmentally responsible; they are free of sulfates, parabens, and chemicals that can be harmful to our bodies and the environment. When choosing products to carry at Mirror & Mantel, I am always looking for a balance between two things: how the product benefits our clients’ hair and how it impacts our environment. With these aspects mind Kevin Murphy was a perfect fit. Born from the same philosophy as skincare, Kevin Murphy products are weightlessly designed to deliver performance, strength and longevity. They choose to work with companies that use micro cultivation, organic growing practices, or ecologically sound wild harvesting techniques to ensure that the entire Kevin Murphy product line is of the very highest, natural quality. And as with all products that we carry at Mirror & Mantel, their hair products are sulphate, paraben and cruelty free. The barbers that founded Imperial set out to evolve the craft of American men's grooming by creating their all natural, utilitarian, premium products that could bring those time honored grooming traditions home. These timeless products are custom formulated with performance, utility, and function in mind. An Australian born brand made with the finest ingredients, Uppercut boasts being a traditional approach to mens grooming. They offer a core range of high quality grooming products for men without all of the "fancy embellishments" of traditional salon brands. Cultivar formulates extraordinarily effective products from the best plant-based certified ingredients. They use strict organic farm-to-workshop standards in their pure, unadulterated condition. They incorporate elements of the rich traditions of ayurveda, herbalism, aromatherapy and the natural sciences to create our line of truly effective, plant-based skin and body care. Their products are made from the highest quality ingredients available anywhere and work so beautifully because the formulas are stellar and built upon absolutely pure and effective ingredients. Free of parabens, sulfates, synthetics, petroleum-based ingredients, perfumes, and harsh preservatives. With firm, honest and transparent ethical stances on their ingredients, production, and packaging: Cultivar is a product line that we are excited to support and share with you. This brand came to life through a musicians inspiration behind the artistry of the unique material found on vintage guitar picks and drum shells-zyl. Using zyl to manufacture their combs, Bixby creates combs that are both extremely beautiful and well designed for styling. These combs are are made in the USA.